For most of our Customers our first recommendation is to "CARTOP" carry your Canoe or Kayaks! WE CAN FIT ALL CARS & TRUCKS with a high quality Rack designed for canoes and kayaks - CALL US! With over 40 years in this business we have many ideas for a more EASY way to load your craft. This not being a viable option for your situation... Read on... There are a few benefits to trailering versus car topping. The first benefit is that it provides a place to store your boats when not being used. Second... You could be all loaded and ready to go with no big hassle. ....SLOW DOWN -the load behind you is very light and may bounce off curbs, potholes and railroad tracks. ....SWING WIDE -or you will cut corners too short and clip a parked car, mailbox or gate. ....ONCE AROUND -before you drive away walk around your vehicle to be sure each boat has bow and stern lines and two hull straps. Check tires and lights, make sure safety pin and chains are secure. ....BOLTED TOGETHER FRAMES -allows inexpensive shipping from china, to the outlet store, or to your home. All those parts take many many hours to assemble and then shake, shimmy, rattle and roll down the highway. ....ENOUGH LENGTH -trying to carry kayaks or canoes on a garden trailer. Look out! too short a trailer tongue and your craft will CRUNCH into the back of your vehicle when you turn. ....ALUMINUM -we will never own another steel trailer. No more scraping rust and painting every year. 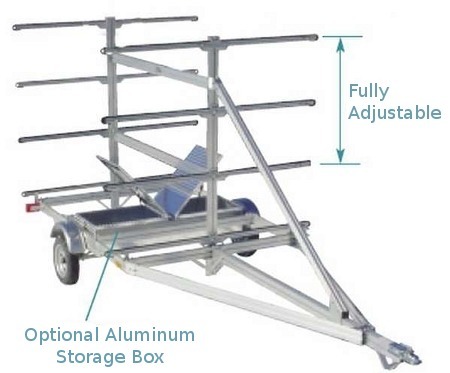 We can lift our Light weight welded frame Aluminum trailers (while loaded or un-loaded) with one hand! If at this point you still want to trailer your boats - Oak Orchard's experience in this field is second to none. 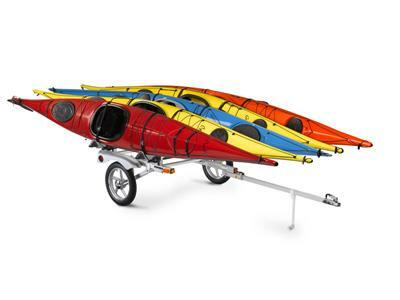 *Over the past 40+ years we have owned, used and maintained many brands and styles of canoe and kayak trailers. *We currently own and maintain 4 trailers ourselves. 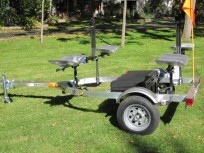 We manufacture the hardware to secure your kayaks or canoes on these high quality trailers. Order Through Us - or find a Triton dealer near you! 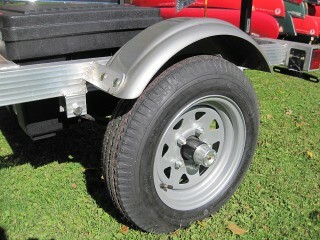 We SELL & MFG the components to convert this or any trailer to carry canoes or kayaks. Carry one kayak up to as many as 6 kayaks. Available in 66" and 78" models. 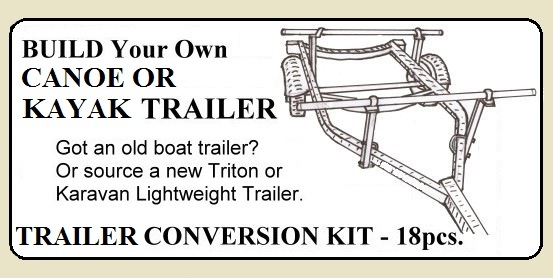 Build your own Canoe or Kayak Trailer with our Trailer Conversion Kit! 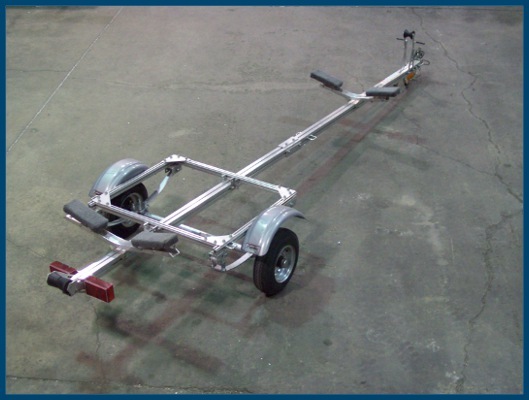 Oak Orchards Trailer Conversion Kit will turn your regular trailer into a Canoe or Kayak trailer. 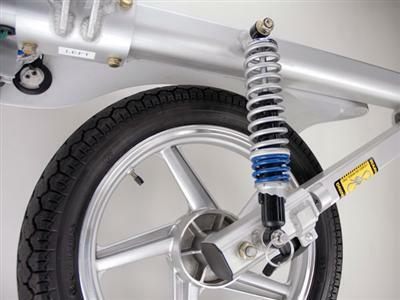 This 18 piece kit includes powder coated steel uprights -which are adjustable in height, Yakima round crossbars, U-Bolts, end caps and hardware. We use this kit on Triton, Karavan and other brand trailers. 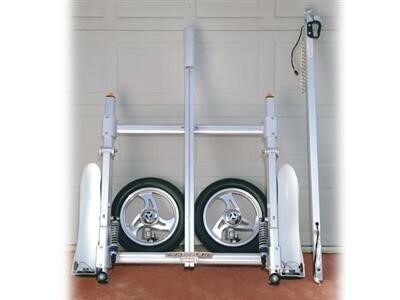 Designed to fit a trailer frame that is 3" tall, trailer frame width can be up to 2.5". 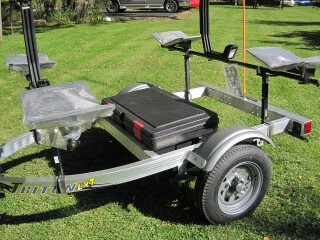 Customize your trailer in order to get the Best trailer system for your particular Canoe or Kayaks. We recommend that you add specific features to this kit such as Gull Wing saddles OR J-cradles for a kayak OR add gunwale brackets for a canoe. 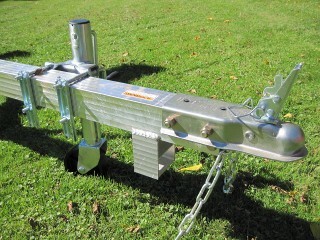 Let us Build your custom Canoe or Kayak Trailer with our Trailer Conversion kit! It all starts with a great trailer. There are so many ways we can setup a Triton trailer for you; it's hard to list them all! 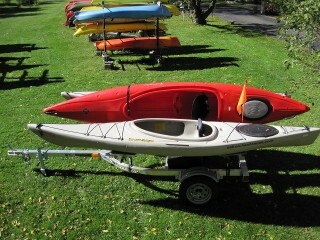 Let us know how many and which brand/model canoe or kayaks you'll want on the trailer. Triton's welded aluminum frame is heavy duty but Light Weight -tow with any car, truck or suv... easily wheeled around by hand. -no need to re-paint like that rusty heavy steel trailer. Wires run thru the Triton frame and tail lights are recessed -you'll have less repairs and less hassle. Big 12" rims, Load Star tires, leaf springs and 2" coupler make for very smooth ride down the highway. 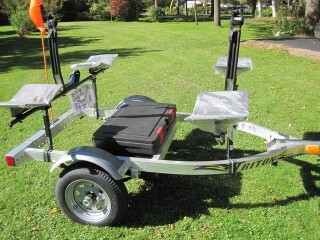 We'll customize your new TRITON trailer in order to get the best trailer system for your Canoe or Kayaks. 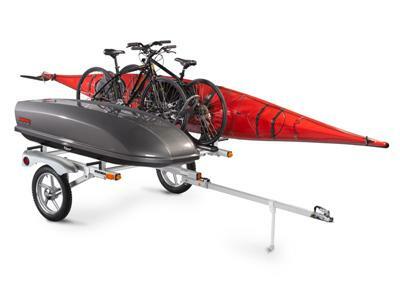 Our standard Triton trailer fits canoes or kayaks up to 14ft. 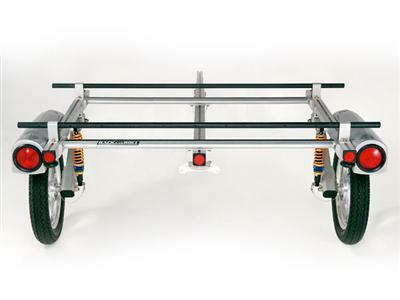 Our Triton LXT-LK trailer fits canoes or kayaks up to 18ft. SUT 220 S and SUT 250 Trailers can be shipped as a kit - UPS direct to you! 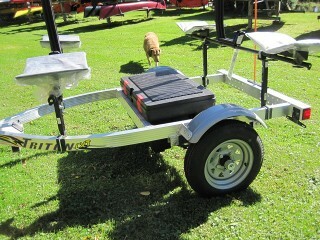 The SUT 220 S trailer works Great for canoes or kayaks. 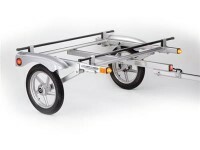 The cradles on this trailer can be adjusted forwards and back. They also can be adjusted for boat width. SUT250M2; $_ -call + $_ UPS -unassembled. 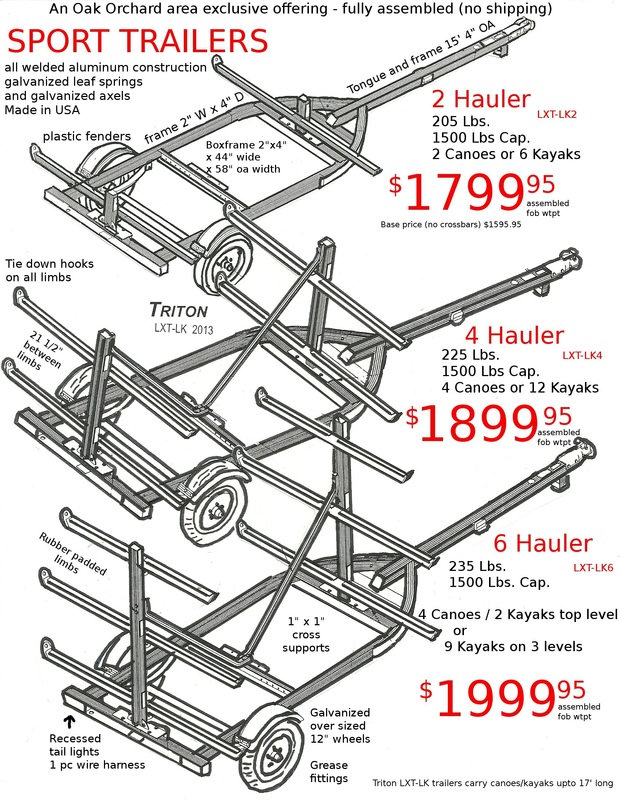 Hobie trailer; $_ -call + $_ UPS -unassembled. SUT-450-M6; $_ -call + $_ UPS -unassembled. UT-1000-8; $_ -call + $_ UPS -unassembled. 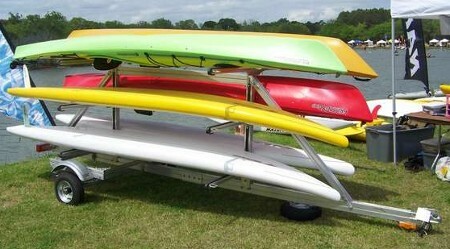 Anodized aluminum trailers by Trailex, custom designed for Hobie. The best trailers for light weight and long, low maintenance, life. Perfect integration with Hobies custom hull cradles. Hobie offers custom padded hull cradles for our Adventure Island, Tandem Island and Pro Angler. Available in 66 and 78 inch models. This high-performance sport trailer takes style and performance to a whole new level. They're literally in a class by themselves, and they take the concept of "utility" from drab to fab with the premium aluminum finish and spiffy alloy wheels. 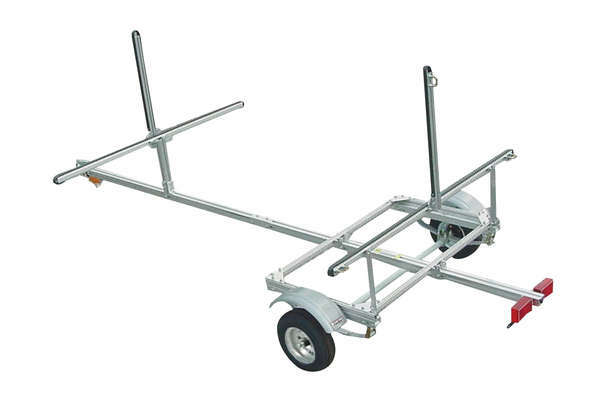 Carrying handle turns your lightweight trailer into a hand cart. Shock absorbers provide four inches of wheel travel, cushioning your gear. The 66" Model weighs 150 lbs empty and has a 250 lb load capacity. The 78" Model is 160 lbs empty and has a 300 lb load capacity. The Crossbars of the 66 Trailer are 66" wide. The 66" trailer itself is 64" wide from fender to fender outside. The Crossbars of the 78 Trailer are 78" wide - the widest roof rack standard. The 78 Trailer itself is 77" wide from fender to fender outside. We do not recommend installing 78" wide Crossbars on the 66" Model for safety and performance reasons. 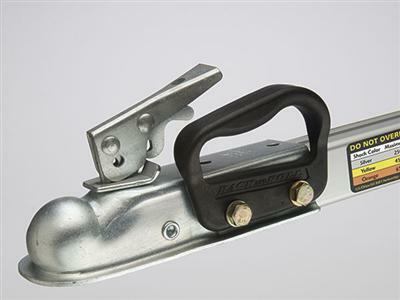 Locking levers with keys prevent theft of your trailer. Wheels and tongue remove in seconds. Frame stores upright (or hangs) onto garage wall. Works with Class I, II & III hitches when a 1-7/8" sized ball is attached. Standard flat 4 light connector to vehicle. One year warranty. All major components are anodized aluminum-6063. The wheels are custom cast and polished aluminum. The wheel and tongue pins are stainless steel. Most of the fasteners are yellow zinc plated steel. The tongue coupler is zinc plated steel. The standard tongue typically allows proper clearance for a single 17 ft. boat or two 16 ft. boats. The optional tongue extension kit makes the standard tongue longer and will allow you to carry up to a single 22 ft. boat or two 21 ft. boats, depending on the vehicle hitch and boat positions. RACKandRoll 66: $2,149.00 -in box. RACKandRoll 78: $2,399.00 -in box. Great storage for paddles and life jackets. Box fits in recessed center cavity of trailer. 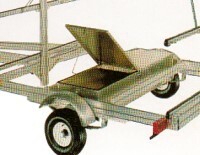 The lid has a center hinge which permits entry from both sides of the trailer. The box dimensions are 67 1/2" L x 22" W x 11" D.
We can ship almost anywhere!